If any portion of your house is made up of siding or paneling, I'm sure you already know how fast it can become extremely dirty. Dirty siding becomes easily noticeable very fast, and accumulates to make the overall appearance of your house very poor. This can be a very easy and inexpensive fix, that is, if you choose our company to clean your siding. We make our services very affordable and make sure the service is done to the high standards we continuously uphold. Using a variety of methods to clean your siding, including rinsing, soaping, scrubbing, and pressure-washing, we have learned that using all these techniques on each job that we ensure every part of the siding is cleaned. 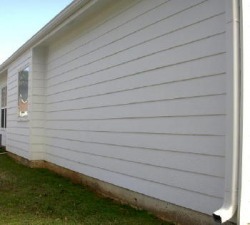 We want your siding looking like its brand new, to have your house looking its best. Contact us today to see the difference we can make. Pricing starts at just $50/hour with a two hour minimum. We can often clean an entire home's siding in as little as 3 - 4hours! And as always, our services have a satisfaction guarantee!